How is the U.S. Constitution composed? The U.S. Constitution is composed of seven articles. The first three articles are the longest and arguably the most important. These three articles explain the powers of the three branches of government—legislative, executive, and judicial. Article I of the Constitution outlines the powers of the U.S. Congress. Article II outlines the power of the president—the chief officer of the executive branch. Article III outlines the powers of the judicial branch. Article IV deals with the states and how the laws of one state are treated in other states. It also deals with how to admit a state to the union. Article V describes the amendment process. Article VI—a very short part of the Constitution—contains the Supremacy Clause, which ensures that federal law and the Constitution are the highest law of the land. Article VII consists of a single sentence explaining that it would take nine states to ratify the Constitution. 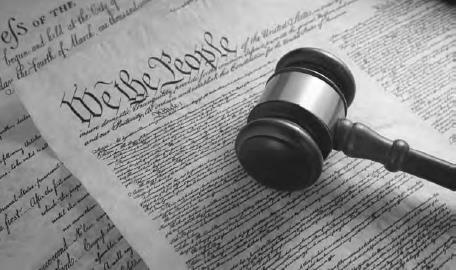 The U.S. Constitution is the fundamental document that establishes a balance of power between the branches of the federal government, as well as for indicating what powers are under state or federal control (iStock).